This manual contains a procedure for environmental assessment of forests based on the analysis of the morphological state of Scotch pine trees (Pinus sylvestris L). Key characteristics chosen as the main integral criteria are: the degree of crown defoliation, needle discoloration, number of cones and growth of end shoots. In the last two decades, mass damage and degradation of forests has been recorded in many European countries. Forest degradation is mainly caused by atmospheric pollution. Acid rains, high concentrations of sulphur oxides and nitrogen oxides as well as ozone in the air cause direct damage to plants; they lead to the worsening of state of forests. The third session of the Executive Committee of the Convention on distant transboundary transfer of air pollutants under the aegis of UNEP (1985) approved and launched the Programme of International Cooperation on research and monitoring of air pollutant impact on forests. The Programme is part of the Global System of Environmental Monitoring. The program is based on the collection of comparable data about the state of forests at a national level and the subsequent exchange of this data, aimed at a better understanding of the problem. The given procedure is relatively simple and reliable to use so it can be successfully applied in the practical environmental education of students. It is based on studies conducted on constant sites and can be used for both long-term monitoring and individual research. The present procedure of study, monitoring and assessment of the vital state of forests is based on the bioindication method. The method consists of an assessment of the environmental status (general vital state of the forest) according to different characteristics of the studied living organism (in our case, pine). In other words, the indicator-species informs us about unfavourable environmental conditions by its appearance: its vital state. What environmental factors cause a certain response of the tree to unfavourable conditions is a separate, rather difficult question, which is not touched upon when the given lesson is performed. It is recommended to use Scotch pine (Pinus sylvestris L.) as a main bioindicating species in the course of this research. If this species is not found in your area, you can substitute another species of pine. Pine trees are one of the best model species to serve as bioindicators. First of all, the pine is very sensitive to even slight changes of environmental conditions, including environmental pollution. Second, pine is widespread in many forested areas of Europe, Asia, and North America; thus it is easy to find suitable study sites. It also simplifies the problem of comparability of data collected in different regions. 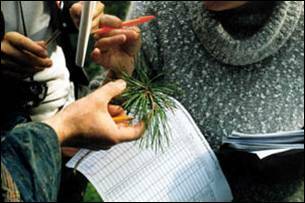 Pine is also a convenient object for study by students due to the fact that pine is an evergreen tree and produces only one shoot a year, which makes observations much easier. From a methodical point of view, pine is a well-studied tree species. Choice of sites and selection of trees for study. Description of the general vital state (GVS) of trees. Evaluation and interpretation of collected data, presentation of the study results. The following items are required for the research: a compass, a measuring tape (one for each team of students), field glasses and description forms (one per group of 2-3 students). As a rule, all long-term studies, especially monitoring studies, are carried out at constant sites. However, if a study takes place only once, it should be conducted at specific fixed natural objects; their choice should be as random as possible. Thus, we reduce the factor of a researcher’s arbitrariness and create the conditions for external control and assessment for accuracy and reliability of collected data. A site for study of the vital state of trees should be situated in a relatively large forest massif; its total area should be not less than 1 hectare (100m x 100m). The site should be located in the heart of the forest and should not border the edges of the forest, forest roads or paths. It is recommended that a site is located at a distance not less than 25 meters away from the forest edges, roads or paths.